Terror in the Skies! ← You Want Me To Wear What? I’m a nerd. I’m a huge, giant nerd. My other blog is about disaster movies. So, that should have been your first hint right there that I am a rock collecting, Bill Nye loving science geek. Therefore, it is without shame that I post these sweaters and admit that yes, I would absolutely wear them if they were handed to me. No, really. Come on, it has teradactyls on it! How cool is that? I’d argue that this is well worth the nearly $270 price tag, if for no other reasons than, well, DINOSAURS. I wouldn’t wear this dress with sequined leggings, but I would work very hard to create an outfit around this sweater dress. It’s a little devastating to me that it’s sold out, because that means I’m going to see women wearing this sweater dress, and I’m not one of them. I like the solo teradactyl on this – it’s a surprisingly simple cardigan, when you consider that it has a giant dinosaur on the back. Normally, if it’s Betsey Johnson, I would expect to see lace hems and polka dots and half of Andie’s prom dress from Pretty In Pink. 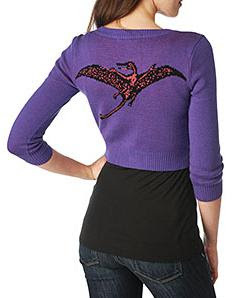 But no, it’s a very simple cardigan with a teradactyl on it. I wouldn’t wear this sweater, only because I have a very short torso and therefore cropped sweaters do me no favors. 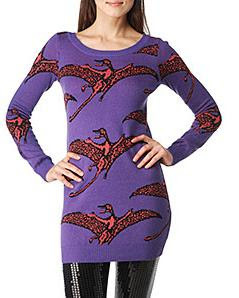 If it weren’t $230, I’d consider buying it just so I can own an article of clothing that has a dinosaur on it. Betsey Johnson gets some major points for designing a sweater and a dress with teradactyls on it – and, beyond that, for letting it stand on its own, as a simple statement of awesomeness. That takes bravery, Ms. Johnson, and it has paid off handsomely.